This battle of the beginners took place in our local games club in the City of Carlisle, famous for being ‘isn’t that nearly Scotland?’. Due to not wanting to play on a cosmic space mat we opted for the plain board. James deploys First – Paul 2nd. Paul Deployment Zone 7, James 5. Next we rolled for first turn, Paul had more activations so it made the roll easier, James had 4 units, Paul had 5. Paul needed a 96 or less and got a 53. James Needed a 78, and didn’t get it, so Paul to go first. Paul first activates his Leonis (well, one of them), And roars before he attempts to charge the Gul-Gabrax, but fails the might check. The Leonis charges, and as terrifying as he may be the Gul-Gabrax pass their fortitude test (Strength in numbers and all that jazz.) Impact strikes first doing a whopping 4 damage. Crushing jaws baby, chomp chomp, managing to get 7 successes off 5 attack dice, 5 go through and double up to 10 due to being +1D10, doing a total of 54 damage killing 2 Gul-gabrax and wounding a third. Paul revels in this, before remembering that the jaws were actually piercing so it could have been more damage, ho hum. The Slashing claws and tramples don’t do very well, with a combination of very bad rolls and very good parries they only do 3 damage between them, meaning a total of 10 blood. James is having none of this, so he hits back with everything in range…. Which is 2 Gul-Gabrax, one of which is the unit champion (I think his name is Steve….). The 1 headbutt is parried, but the Warcleavers mighty 7 dice rip into the Leonis, 6 go through and 3 were parried (how do cats parry?) causing 28 damage and the Leonis loses one attack (taken off trample). 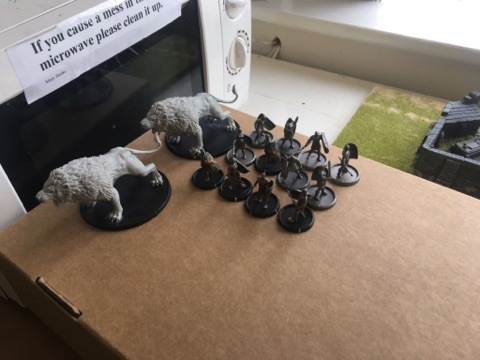 Combat res – the Kitty is victorious, but due to the Gul-Gabrax being in the unit with the Warlock they are fearless, so they stay where they are, or so we thought, but more rules reading after the battle over a nice cup of tea meant they weren’t actually fearless. James activates next, hit plan to activate his general doesn’t work as it is locked in combat, but due to acuity Rhinocat activates, charging Leonis number 2. This other kitty countercharges, but Rhinocat goes first due to some wizardry called ‘the rules’. Unit strength the same so no impact hits (boo) Leonis also feral so doesn’t care about terrifying (BOO) (in fact a lot of the stats between the Feleox an Leonis are the same, is this a case of ctrl+c, ctrl+v?). Crushing jaws gonna crush, hitting on 4s, 5 hits, 9s to parry (remember piercing kids) all go through, 40 damage, which is just rude. Slashing claws up next, hitting on 4s, all hit, 7s to parry, 2 go through, and sadly (or luckily, depending on who you want to win) 3 damage. Lastly come the tramples hitting on 4s, 5 hits, 7s to parry, 5 successes, no damage (damn this Kitty can parry). But Rhinocat cares not about parry, for he has accumulated 8 blood, moohoo and indeed haahaa. The Leonis hits back, jaws hitting on 4s, 4 successes, 9s to parry, 3 go through, 39 damage. (only 1 less than the Feleox in disguise, almost as if they were very similar creatures) Claws, hit on 4s, 5 successes, needs to parry on 7s, 1 goes through, 7 damage. Now there are less tramples as the Leonis has already takin quite a bit of damage, causing 6 damage. Trample (2 dice, taken dmg) hit on 4s, 1 hit, parries on 7s, 6 damage. Combat res, Rhinocat wins! Meaning Paul’s Leonis has to roll on the result table, causing 3 damage by rolling the ‘flay’ result, queue ‘stop hitting yourself’ jokes. 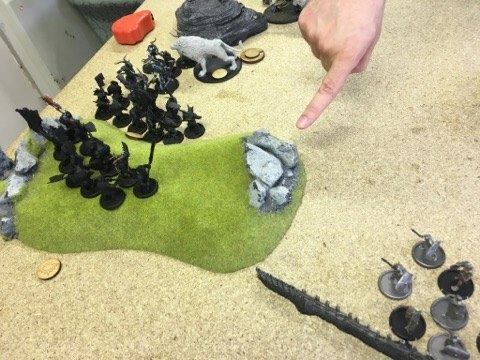 James activates a squad of Gabrax and moves them towards the shooty Legionnaires, then try to retain in initiave to activate another squad (rules…..) . but on a roll of 93 it fails. 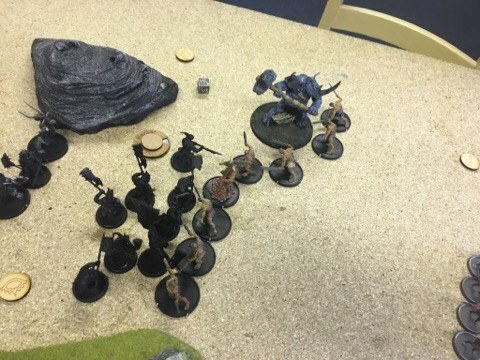 James up next with the other Gabrax unit, charging the Leonis, but fails the terrifying check on a 98 leaving the Gabrax shaken, who yet move to engage but can’t engage. The Leonis reacts to this confusing version of ‘knock and don’t run’ with a combination of Jaws, Claws and Tramples, causing a total of 45 damage. Combat res – Paul wins, James rolls a fortitude check and passes. Final move of the first battle hour, Paul moves the demilegionnaires a bit. Blood is cooled, Pepsi Max and Irn Bru is Drunk, shall we carry on? The Gabrax successfully pat themselves down and are no longer on fire, while the Legionnaires on Hold orders drop shieldwall but remain in tight formation. James activates the Gabrax unit on the hill (regardless of feral needing to go first, as we said, beginners) and attacks the legionnaires unit that has the Centurion in it. The Untain attacks first with his mighty cleaver (I think I am using mighty too often, maybe his tremendous cleaver?) 6 attacks, 5 hits, 39 damage, exactly 3 dead legionnaires. Then the hornbutt, 2 hits including 1 TREMENDOUS strike! 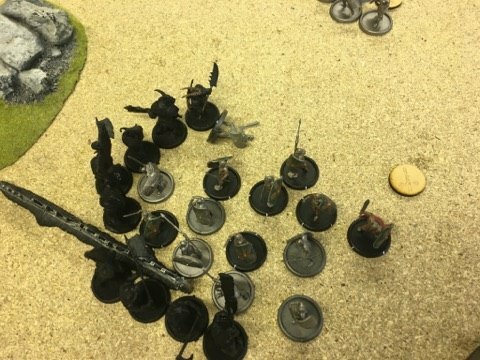 The Legionnaire fails his constitution check and is prone, unconscious and very, very dead with 34 points of damage done. The rest of the Gabrax attack, 5 in range, 11 hits, doing 69 damage, which hurts bigly. Lastly the headbutts, which do no damage. 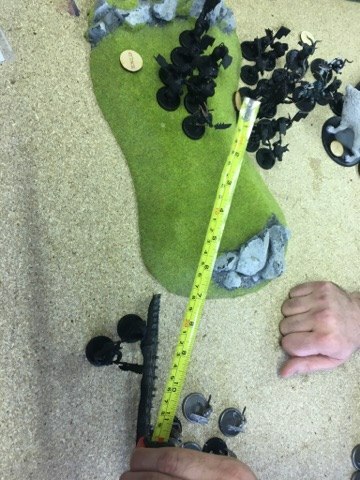 Combat res – James wins, and the Legionnaires fail their break test and flee, however the Gabrax skipped leg day so don’t get a high enough score to chase down the unit. 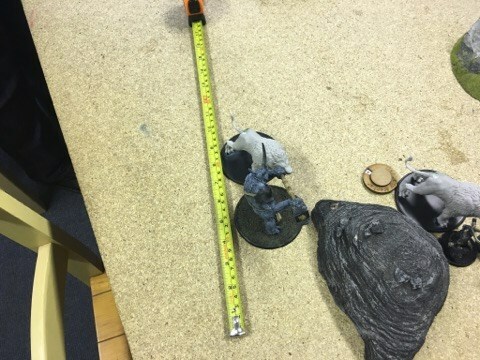 At this point James is a sneaky bugger and tries to retain the initiave and passes activiating the unit of Gul-Gabrax with the Warlock of Baalor. He tries to Inspire the unit of shaken Gabrax but fails on a 99. He then does some magic spells, managing to increase the Gul-Gabrax weapons to cold and doing an extra 23 damage, and the closest squad of Gabrax gaining an extra 46 armour. 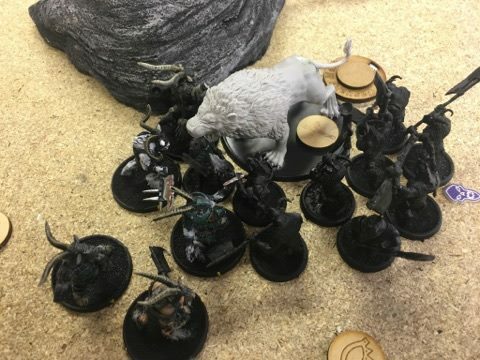 The Leonis retaliates, managing to hit 4 times with the crushing jaws, doing 34 damage, however the slashing claws and the 1 remaining trample attack fail to do anything. combat res the Leonis wins! 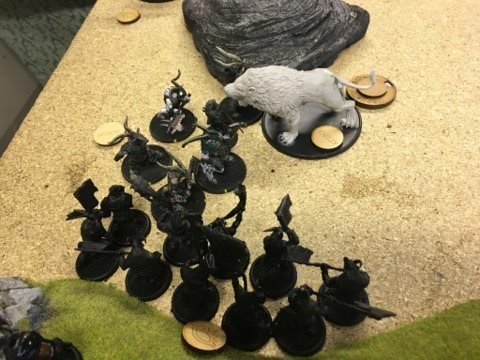 But once again due to misunderstanding rules we thought the GulGabrax stayed there due to the Warlock of Baalor being fearless. 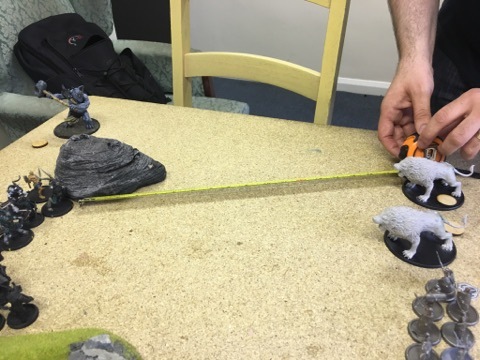 Now James activites his Feleox, I don’t know why we bothered to roll any dice, but as you may guess he managed to kill the Leonis. 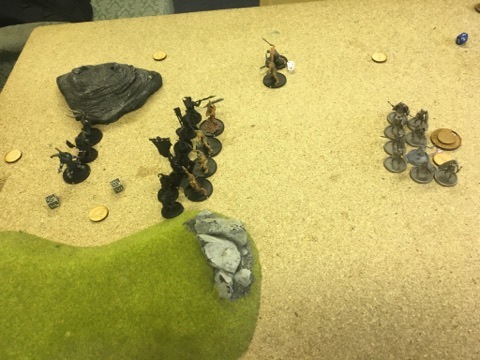 Now Pauls Magus activates, and although the unit turns to face the Gabrax chasing the Centurion unit, shoots them with 2 spells in the back arc, both of which causing panic checks he only manages to do a total of 31 damage between both spells. I have decided that Hardy can naff off. 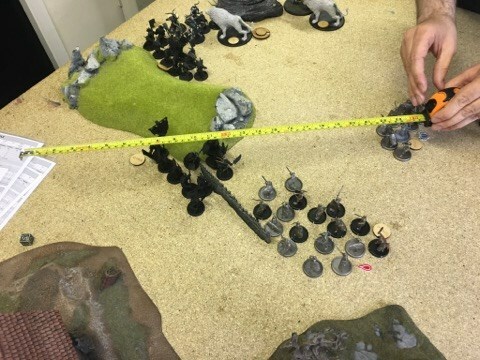 James - activates the unit of Gabrax and wails on the Leonis – 13 dice, 11 hits, parrying on 8s, 16 damage dice (blood for the blood purposes) 97 damage! Last activation of the battle hour, Paul Activates the demilegionnaires and splits his charge between the feleox and gabrax, 4 into cat, 4 into Gabrax, but the Feral feleox countercharges! Demilegionnaires hits back, managing to finish off the Rhinocat who was sitting on ‘not a lot’ of health. Butcher bill – Paul 574, james 573, stalemate ! Great stuff lads! 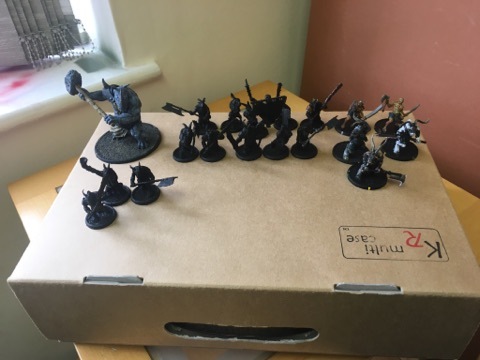 Excellent battle report and it looks like you had a laugh. We think the Leonis that reacted can still act as he is Feral? He can't - once a frenzied unit is alert, it can only ever React. So if something Attacked the Leónis, he could then React, but he couldn't Attack by himself unless he was lively. 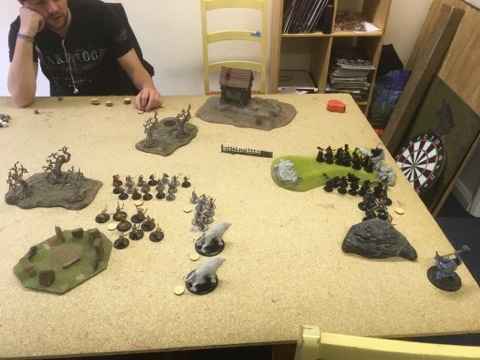 Thanks for posting this battle report Paul, I really enjoyed reading it!